To get your Program home to the planet Ram while avoiding Walls, Bugs and the evil overlord CPU. How does Bits and Bytes help your child? Bits and Bytes helps teach children computational thinking. It teaches a combination of problem solving, logic, algorithms and much more. Children learn how to break problems down into the smallest steps required to achieve a solution (algorithms). Bits & Bytes has been designed to help familiarise children with the world of coding so when they are ready to start coding it’s a far less daunting proposition (i.e. character names used are based on actual computer terms, actual computer terminology in used in the rules, the backstory explains how a computer works, the font used is common to computer programming interfaces and much more). By playing Bits and Bytes children are having fun but they are also making the connection that the game has something to do with computers, which is important for learning computational thinking. Far from Earth on a planet called Ram, live the Programs – small monsters with stumpy legs and big toes. Life on Ram was idyllic until the dreaded CPU arrived. No one knows where he came from but his appearance is not of their world. CPU is the overlord of Ram and ruthlessly controls it, telling the Programs exactly what they can and cannot do. Nobody dared to disobey him, until four best friends – Data, Perl, Bit and Byte – defied him. They were playing where they weren’t allowed when CPU caught them. Enraged by their disobedience CPU banished each of them to separate corners of the galaxy – far from Ram and their families… But nobody tells Data, Perl, Bit and Byte they can’t go home. Can you help Data, Perl, Bit and Byte to return to their home, Ram, without being caught by CPU or his feared henchman, Bug? The backstory to Bits & Bytes familiarises children with how computers physically work. In a computer when you run a Program it lives in the RAM (Random Access Memory) component and the brain of the computer that controls everything is the CPU (Central Processing Unit). By reading this backstory children learn by association and understand how computers actually work. Shuffle the Grid cards (the Grid cards are the small cards with an orange back) and set the cards up as shown on the right – we refer to this layout as the Grid. The Programs should all be facing in a clockwise direction (the arrow above the Program’s head determines the direction it is facing). Please note: By default there are 60 Grid cards included in the game but only 56 are required to play. Place the 4 spare Grid cards to one side (they are not needed). Step 3: Who goes first? The youngest player goes first and play moves in a clockwise direction (taking it in turns). On a player’s turn they show the other players the INSTRUCTION card they want their Program to move or turn (they are issuing a line of code to their Program). Refer to Step 5 and 6 to understand what happens if they show a TURN card or the MOVE FORWARD card. Please note: The player does not hand over the Instruction card but shows the other players (the player should always have 4 different Instruction cards to choose from each turn). It is important to note that TURNING and MOVING the Program are two separate steps. This is important as the players are learning to break problems down into their smallest steps/components. If a computer programmer wanted to write a program to turn an object 90 degrees and then move it forward. They would have to write a line of code telling the object to turn ninety degrees and then a second line of code to move the object. And of course the Instructions (lines of code) have to be in the correct order, otherwise the object will end up in the wrong location. If the player shows a TURN instruction card they turn their Program as per the Instruction card. In other words, if they show a TURN RIGHT card their Program turns 90 degrees to the right; if they show a TURN LEFT card then their Program turns 90 degrees to the left; if they show a TURN AROUND card then their Program turns 180 degrees (facing in the other direction). In the example shown on the right the player decides to show a TURN RIGHT instruction card, which turns their Program to the right – but this does NOT move their Program forward. Turning and Moving are two separate steps (this is important as the players are learning to break problems down into their smallest steps/components as would be required if they were programming a computer). The FUNCTION gem is part of the Advanced Rules for Bits and Bytes and should only be introduced for older and/or experienced players. Please do not introduce this too early as it may cause frustration. On planet Ram there are special gems, called FUNCTIONS, which can grant the finder of the gem the ability to issue one advanced command to their Program. A player can play the FUNCTION card at the start of their turn, it can only be used once and the issued command can only last one turn. It is up to the child’s imagination to fill in the blanks, as long as they structure the command correctly using the above terminology and structure. The above two commands are actual computer functions and by introducing the Function Gem into the game then children are actually learning how to create real-life functions. The IF… THEN… Function is an example of a conditional statement. The DO… UNTIL… Function is an example of a looping statement. Finally, creativity is an important part of computer coding and should be encouraged at all times. The Function card allows the children to apply their creativity to real world computer functions. Step 2: What happens after I play the Function Gem card? A player must still turn over (reveal) the card in front of their Program before they can move forward. The normal rules for the revealed card are played (see point 7 in the section titled “Playing the Basic Game”) unless their issued command counteracts the effect of the revealed card. For example: A Player issues the command: DO keep moving me forward UNTIL i hit a wall. The player would then reveal (turn over) each card in front of their Program before moving forward. If the revealed card was blank they could move forward, however if they reveal a BUG then as per the normal rules for the BUG the player would have to return to their starting position (in the corner of the Grid). The Advanced rules are intended for players who have mastered playing Bits and Bytes. Please do not play the Advanced rules until all players are ready as it may cause frustration. 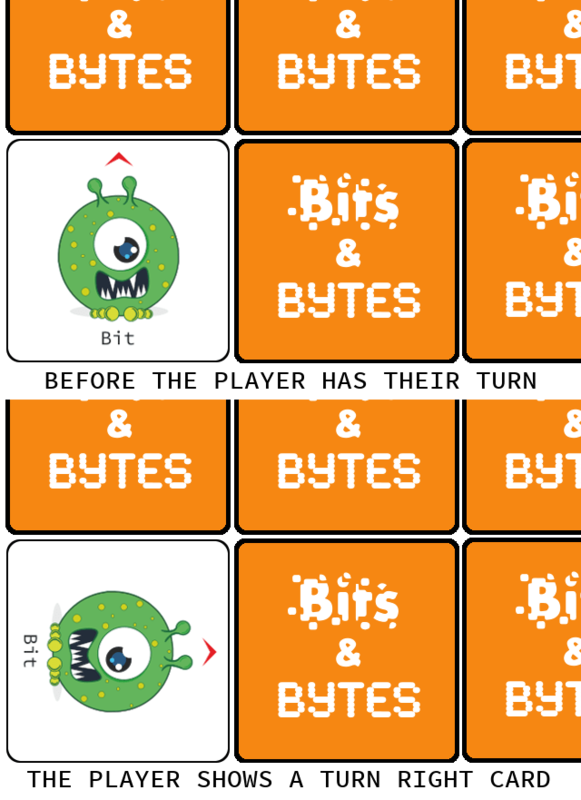 As Bits and Bytes is a card game it is very flexible (does not have the restrictions of a board game) and is very easy to make the game harder or easier (for very young players). How do we play the Advanced game? By playing the advanced game players are in effect writing a computer program using only the cards. By laying out every step their Program must take in advance and then running their Program through each step, the player has created a computer programme using cards only – where each instruction represents a line of code and if there is an error they need to debug their code, just like a real computer programme! If a player has had their turn but their Program failed, then that player must remember what INSTRUCTIONS they issued previously (and in what sequence) and then work out how to fix (debug) their Program. If the players are playing on a 10 x 10 Grid or even larger then the number of steps they must remember is considerable and highly challenging. Can I make the game harder or easier without playing the Advanced rules? The game by default comes with 60 Grid cards (the small orange back cards) but only 56 cards are required to complete the 8 x 8 Grid. To fine-tune the level of difficulty then the players could remove 4 Wall cards thus leaving more blank cards, or vice versa they could make it harder by removing 4 blank cards, etc. Can the players ``tweak`` the rules? There are many and we encourage the players to experiment with creating their own rules (creativity is a key part of computer coding and should be encouraged at all opportunities). One example of “tweaking” the rules is the BUG card. Instead of having the player who revealed the Bug return to their starting position, the player can nominate somebody else to return to the start. The only condition to changing the rules is for all players to agree to the new rules prior to the game starting (this avoids arguments and allows children to collaborate on creating their rules). The player has two Function gems, can they play them at the same time? Yes. This is called “nesting” in computer terminology. It is more difficult to phrase correctly and does require some thinking. In the above example the player’s Program would keep moving forward until it hit a wall and if they did then they would turn right. When a player shows the Function gem, can they issue multiple Instructions? Yes, but please remember this is for advanced players who have mastered the game. The above command would allow the Program to zig zag across the board (normal rules of the Function gem and revealed cards would apply). We are constantly tweaking our rules based on your feedback (to make the game as simple as possible for children to play). If you would like to download the latest version of the rules then please click on the link below. Do you have any Questions on playing? If you have any questions about playing the game please do not hesitate to contact us by completing the below form and we will reply as soon as possible.